For fans of Sculptor John Aaron of Modern Arf, here's a holiday greeting from Aaron's cat, white guy, at gallerycat. The DC Commission on the Arts and Humanities in collaboration with the District of Columbia, Department of Driver and Motor Vehicles is seeking an artist or artist team to design a specialty arts vanity license plate for the District of Columbia. The theme for the license plate is "Artistic License." The design should inspire residents and visitors to support the arts and help bring attention to the DC Commission on the Arts and Humanities. This call is open to artists who live in District of Columbia. To download an application visit www.dcarts.dc.gov and click under "Current Call for Entries". For more information email Deirdre.Ehlen@dc.gov or call (202) 724-5613. I met up with Mark Planisek at one of the 9 X 10 WPA/C member shows this year. He was showing an intriguing series of mixed media collage boxes. Mark Planisek was interviewed by the Washington Post about his job at the National Portrait Gallery on December 23. Read the article HERE. One space; 60 local artists. Double Vision allows not only a taste of what each Touchstone artist is doing (one piece each) but also THE taste of each Touchstone artist. By inviting a guest artist to show work with one’s own, the artist’s vision is displayed beyond the subjective to the objective. Come and let us share with you what we find aesthetically pleasing/ exciting/challenging. There will be great variety - from representational to abstract, hard edge to impressionistic; sculpture, painting, photography and many other media. Touchstone, an artist-owned gallery, has been serving the Washington community for over thirty years by exhibiting the highest quality of contemporary art. to the discerning eye and the creative imagination of our patrons. streets of Crystal City in April 2008. As part of this public art opportunity, the BID is announcing a final Call for Artists. The Crystal City BID welcomes completed applications from interested artists and designers throughout the area. Details can be found at www.crystalcity.org. Once selected, talented area artists will kick-off the airplane design and paint process in late January. Lowe Enterprises Real Estate Group has generously provided the workshop space to store and decorate the planes, and JK Moving and Storage, Inc., has partnered to provide critical technical support for the handling of the planes. For more information, visit www.crystalcity.org. A unique seasonal shopping experience in the heart of downtown Washington. For 17 exciting days from Noon to 8:00 pm, the sidewalk on F Street between 7th and 8th in front of the Reynolds Center for American Art and Portraiture is transformed into a marketplace of local artisans selling a diverse array of goods including: art, crafts, jewelry, textiles, photography, pottery, clothing, prepared food and other high quality gift items. Enjoy live entertainment and refreshing food and beverages while you shop. Take metro to Gallery Place, exit at 7th Street NW and you are there. Enjoy! Associate Editor, Beth Farnstrom just started a column on the visual arts in DC for Washington Life Magazine. Her first piece includes the PinkLine Project's founder and art collector, Philippa Hughs local art picks for December and January. Read it here. I was away for this lecture and hope someone will fill me in. Over at Eye Level, Howard comments "Pop Goes the Artist: James Rosenquist at SAAM"
View the Webcast of Rosenquist's lecture and check out his Industrial Cottage, acquired by SAAM in 2006. A bonus! Way to Go! Here you will find calls for artists, as well as photos of installations along the way. Best Bet... Bill Dunlap reviews this exhibition, part of the "ART of CONFRONTation" exhibit, which features around 79 paintings and drawings by Fernando Botero of the Abu Ghraib prison. The Washington Project for the Arts, WPA launched the WPA ArtFile Online this month. The File is an interactive web-based image registry of WPA members’ artwork, accessible 24 hours a day through the WPA’s website. Applications for the 2008 Bethesda Painting Awards are due Friday, February 15, 2008. Up to $14,000 will be awarded in prize monies. Applicants must be over 18 years of age and residents of Maryland, Virginia or Washington, D.C to be eligible. All original 2-D painting including oil, acrylic, watercolor, gouache, encaustic and mixed media will be accepted. Slides or digital entries on a CD are permitted. There is also a $25 non-refundable application fee. The deadline for submissions is Friday, February 15, 2008. You may find an application form at www.bethesda.org . Go to http://market5gallery.org for information about the gallery. Over 66 works of art by some of the most important self-taught artists today. Transformer presents: wall/paper A group exhibition featuring selections from Transformer's Flat File Program. Launched in spring 2007, Transformer's Flat File consists of unframed works in a variety of two-dimensional mediums including photography, painting, drawing, and printmaking, all approximately 16" x 20" in size and smaller. Featuring works by regionally, nationally and internationally based artists, the program is open to artists that have exhibited with Transformer in the past and those who are new to Transformer. wall/paper highlights selections from the current Flat File, as well as new work by April Behnke, Miles Bumbray, Jennifer DePalma, Benjamin Jurgenson, Andy Kozlowski, and Lauren Vincelli. All works in wall/paper and in the Flat Files are available for purchase. Works by April Behnke and Benjamin Jurgenson are included via courtesy of Meat Market Gallery. EXHIBITION HOURS for wall/paper: Wednesday - Saturday, 1-7pm by appointment. Transformer will be open by appointment only December 26 - 29. How do we experience the passage of time? While physics may accurately describe a universal space-time, our human experiences seem to defy uniform time on a daily basis: each of us has lived a moment that seemed to last forever, or hours that passed by in a heartbeat. Margot Quan Knights large scale photographs turn to the physical body, that portal through which all experience arrives. She proposes that the body responds to dense experience by expanding mental focus on the activity at hand, to the exclusion of all other thoughts. In creating the Intervals series Knight looked to Caravaggio, especially his painting Death of the Virgin, and more current works by Bill Viola, Karolina Sobecka, and Sam Taylor Wood as inspiration. She also drew on the personal experiences of losing herself in thought, in a household task, in the chaos of her wedding, and in the interminably long, clear moment of a car accident. New works by gallery artists. Brown is the recent recipient of a Tiffany Grant and a Joan Mitchell Award. Jefferson Pinder’s new work, Shoeshine Variation, 2007, both glorifies and archives a service that is quickly disappearing from our fast-paced culture. This diptych video provides a glimpse into the grace and beauty of the shoeshine, while delving into the symbolism wrapped up in the task. As master shine man Ego Brown builds the shine, Jermaine Washington, social provocateur, deconstructs. This narrative guides the viewer through the process of a shoeshine variation that drifts in and out of reality, asking the viewer to actually focus on the multiple interpretations of the act itself. Thursday, December 20 at 6:30 p.m.
Join author Lin Arison and photographer Neil Folberg to celebrate their new book, Travels with van Gogh and the Impressionists: Discovering the Connections. Arison's captivating memoir of her journey through France in search of the lives and art of the impressionists is illustrated with beautiful works in this genre, in conversation with contemporary photography by Folberg. Arison will explore the continuing relevance and personal significance of the artists and their pioneering achievements, while Folberg discusses the challenge of capturing the spirit of impressionist painting in a different medium. The evening includes a book-signing and reception. Included in museum admission; free for members. The Washington DC Southwest Neighborhood Assembly History Task Force Call Box Committee, in collaboration with Cultural Tourism DC, seeks artists to participate in Art on Call. This public arts project is a city-wide effort led by Cultural Tourism DC in partnership with the DC Commission on the Arts and Humanities and the District Department of Transportation to restore Washington, DC's historic abandoned police and fire Call Boxes as neighborhood artistic icons. Art on Call challenges artists to use existing police or fire Call Boxes as frames for the artist's unique and creative image or design that can be permanently installed within the call box. For more information regarding this opportunity and for a copy of the prospectus please email swcallboxproject@gmail.com. 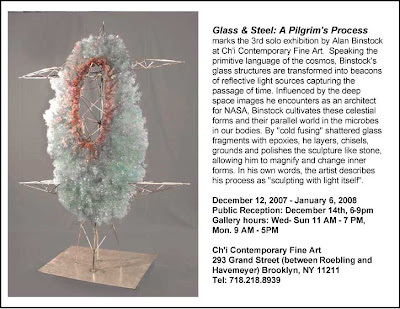 One of my favorite sculptors in the DC region, Alan Binstock is showing at Ch'i Contemporary in Brooklyn, NY this month. Gallery 211 invites you to join them for some live music on Saturday December 15th from 6-8 p.m. Harpist Cara Fleck will provide a solo performance featuring classical and holiday pieces. Enjoy some wine and light refreshments amidst the current exhibit featuring the ethereal landscapes of Freya Grand. Please visit the Gallery 211 website at www.gallery211.net for more information about Ms. Fleck's biography and directions to the gallery. Project 4 recounts the tales of our particular culture through individual perspectives. Chasing Tales features eight different artists who discuss how myths, narratives and fantasies have shaped Western Culture. Religion, literature, games, entertainment and societal myths are among the concepts explored through media, including photography, video and traditional painting techniques. Each artist's work reflects both an individual perspective of the artist's place within his or her narrative and a shared cultural experience. In exploring the history from which they derive, these artists are presenting historical narratives under a new lens. Painters Nancy Baker, Raymond Uhlir and Anthony Pontius use traditional models of pictorial representation as a departure point, and then incorporate contemporary characters and events in order to depict either cynicism, confusion or amusement with our culture. Photographer Kim Keever uses a traditional model of pictorial representation as a jumping off point as well, but mocks the grandness of the sublime American landscape and its ideals by imitating its space with a fish-tank in his apartment filled with kitsch terrarium novelties and dyes. "The Septemberists" by Anthony Goicolea is a romantic and moody video which elegantly narrates the struggles and awkwardness of adolescent boyhood in our culture, a theme that Goicolea commonly employs. The intersection of escapism and reality can be seen in all of the works shown; with these juxtapositions new tales and trajectories result. For additional information please Contact: Anne Surak , Director. Tonight, I missed Touchstone Gallery's Art on the Small Side Holiday Juried Exhibition Opening. I plan to go by to see the show as soon as my jetlag subsides. The exhibit was juried by Rosemary Luckett & Jon Wassom. In keeping with its tradition of showing affordable art during the month of December, Touchstone Gallery offers a juried show of mixed media art and fine crafts sized at 18 inches and under by artists from the metropolitan area. 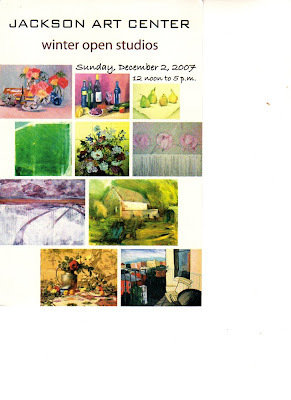 Sunday, December 2, 2007,12 - 5PM. The paintings by Colombian artist Fernando Botero at the The American University Museum's Katzen Center are featured in an article written by Tim Harper in the Star. Authentic Art's, Sharon Burton has launched her website, Gemini Visions Art Studio, where you can see all of her artwork. Check it out at www.geminivisionsart.com! The Capitol Hill Art League presents Wrap It UP! The Capitol Hill Art League presents their annual Holiday Show, Wrap It UP! A holiday show and sale of gift-priced artwork. Take it off the wall and they'll wrap it up! Opening Celebration Saturday, December 8th, 4-8 pm, The sale continues through December 22nd, enjoy music, champagne, and good company. Sponsored by the Girls Gotta Run Foundation, Inc. Profits from the sale of artwork go to buy running shows for girls in Ethiopia. By training as athletes, these girls can delay traditional arranged marriages which can occur as early as 12 years of age. Check out the art; chat with the artists; enjoy wine, coffee and hors d'oeuvres; listen to the marvelous music of the "Basso Moderno Duo" . Check out the art; experience a traditional Ethiopian coffee ceremony; see the work-in-progress Girls Gotta Run DVD, and a documentary of an Ethiopian coffee farm. The Art with Joe Series at Peace and A Cup of Joe in Baltimore Maryland presents RED.Opening on World AIDS Day, December 1st. RED is a visual exhibition of original artwork expressing the hopes, fears, experiences dreams about the struggle with HIV/AIDS epidemic in this country and around the world. A portion of the sales of artwork for this event will be donated to CARE's I AM POWERFUL Campaign and HIV/AIDS Program and a second charity, a Baltimore based organization for the fight against HIV/AIDS. The reception will feature an opportunity for guests to make their own postcards to express their thoughts, hopes, dreams about HIV/AIDS or to honor a loved one who has AIDS, courtesy of Creative Cause, an organization that creates campaigns for causes that change communities for good. Special guests include representatives from CARE and other organizations that will share information about how you can help fight HIV/AIDS in your communitiy or around the world. Stocked with unique crafts and original artwork while boasting a festive atmosphere, the Long View gallery is a wonderful destination on your gift buying journey. On display this season will be new oil paintings by Chris Stephens, hand-carved wooden vessels from Michael Bauermeister and a range of beautiful works by regional artisans. Also on display will be a preview of works by artists showing with Long View Gallery in 2008 including Scott Brooks and Rob Jones. Join leading stars and emerging talents of Mexican film for a 3-day celebration honoring the new wave of Mexican cinema! Five world-class directors will present 5 films that capture the spirit and creative brilliance emerging in Mexican cinema today. In addition, five award-winning Mexican short films will also be featured during the festival. Engage and meet with some of Mexico’s premier talents in discussions and Q&As following each showing! Enrich your awareness of outstanding films and celebrate the new wave of Mexican cinema! Each of these artists begins with ordinary objects or shapes and transforms them into lively, animated sculpture full of humor and poetry. Using clay as a primary material, these three artists are able to bring an instinctive spontaneity to the highly individualized process of transporting the mundane and pedestrian into a realm electrified through imagination. Using an abstract vocabulary, Lynn Putney creates small, subtle paintings that glow with a quiet, magical intensity. Arranged in constellation-like formation, the works evolve through a process of sifting and distilling, as Putney layers the thoughts, feelings and visual stimuli accumulated through daily living into composition that spark universal recognition. HAMILTONIAN GALLERY reports that the first phase of the renovation project for their new home at 1353 U Street NW is well underway. The site is situated in the heart of the 14th/U Street corridor and the building is a historic building from the 1920s. Upon completion of the renovation project in June 2008, HAMILTONIAN ARTISTS and HAMILTONIAN GALLERY will occupy the store-front level of the building. Hopefully, another art space or art-related business will occupy the second floor space. The HAMILTONIAN BLOG has launched on Blogger to provide timely updates on the progress of the renovation project and other happenings related to both Hamiltonian Artists and Hamiltonian Gallery. HAMILTONIAN ARTISTS continues to accept applications for the So-Hamiltonian Fellowship Program until the DEADLINE on JANUARY 15, 2008. Through innovative and groundbreaking programs, Hamiltonian Artists and Hamiltonian Gallery seek to create a new physical and institutional structure in Washington DC to support emerging artists, broaden cultural dialogue within the community and make visual art accessible to a diverse audience. Hamiltonian Artists is a 501c (3) nonprofit organization dedicated to build a dynamic community of innovative artists and effective visual art leaders. Christopher Myers reacts to today’s glut of digital imagery by relying upon the ease of point and shoot technology in Standing on Two Eyes. He deals in process: heating the film, affixing it to glass, reworking the negatives chemically, developing them as gelatin prints and scanning the images to create dream-like giclée prints. Thurs Dec 6 at 6:30 p.m. Presented in cooperation with Artomatic, Inc., the Washington DC Economic Partnership, and the DC Commission on the Arts and Humanities. "The use of art to change students' attitudes is at the heart of my vision of education. The goal is not to produce artists but to find a tailored approach to learning that will redirect troubled young people, get them into college and on to productive lives. I see a connection between the creativity instilled by a love of the arts and the skills needed for business success." said Bill Strickland. For the past 40 years, Bill Strickland has been in the business of shaping - and changing - lives. It's a business model that works. At the heart of their unique interrelationship, Manchester Craftsmen's Guild and Bidwell Training Center, Inc. share a dedication to helping disadvantaged residents of the Pittsburgh area by offering them exceptional quality educational and cultural opportunities. Strickland will describe his journey from inner-city youth to head of an organization that fosters art, occupational skills, and the equal availability of quality of life for every person. "I wanted to build something that would give the people who come here a vision of what life could be, to create an environment that says that life is good," said Strickland. Attire is business casual. Children ages 12 and over are welcome. Seating limited to 350; first come, first seated. No reservations required. ZooLights at the National Zoo in Washington, DC is a winter holiday event that is sure to be fun for the whole family. The National Zoo presents a display of thousands of sparkling lights and animated exhibits as well as brightly illuminated trees, shrubs, and statues. Visitors at ZooLights will also enjoy winter-themed crafts, ice sculpting demonstrations, choral groups, and storytellers. Tickets are on sale now! Find the details about ZooLights at the National Zoo. Tickets are available at the Zoo's Visitor Center or by Ticketmaster. Kids under two are free. Works depicting the Gullah and African-American culture of the South Carolina Lowcountry are at the heart of this show of paintings, batik, collage, sweetgrass baskets and glass, inspired by the landscapes, churches, school houses marshes, moonlight and traditions of the unique Sea Islands region. The Clarice Smith Distinguished Lectures in American Art present new insights from the perspective of a critic, a scholar, and an artist. This annual series is made possible by the generosity of Clarice Smith. Artist James Rosenquist's talk is entitled, Fine Art is Not a Career! Free tickets available in the G Street lobby, one hour prior. Adventures of Hoogrrl! 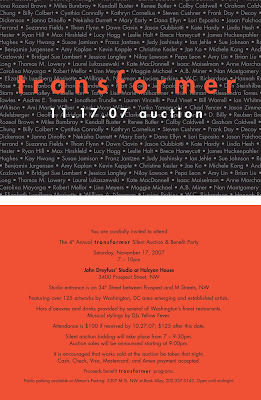 : Transformer auction was a huge success! Read what Philippa P.B. Hughes, Transformer Auction Co-Chair and Founder, The Pink Line Project says about Saturday night's auction. An exhibition of new and existing gallery artists with works priced at $500 or less. The DC Commission on the Arts and Humanities invites you to submit nominations for the Twenty-Third Annual Mayor's Arts Awards. The Mayor's Arts Awards are the most prestigious honors conferred by the city on individual artists, organizations, and patrons of the arts. Awards will be presented and hosted by the Mayor at a ceremony on March 17, 2008. For more information please contact Lisa Richards at 202.724.5613. DEADLINE: December 4, 2007, 5:30pm. Holiday Open House on December 1, 4 to 7 pm. NKG welcomes the Third Annual Attainable Art Show: Works Under $1500. Arkin, Joan Belmar, Mary Chiaramonte, Lukasz Huculak, Mark Parascandola, Ellyn Weiss and Ming Yi Sung Zaleski (and many more!). American University's "Claiming Space: Some American Feminist Originators"
The Writer's Center in Bethesda is currently looking for an artist to feature on its winter class brochure. They are looking for artists that have winter landscapes, nature prints, and or abstracted work with cool palettes. Please submit images to jwalton@writer.org that are no larger than 300 dpi for consideration ASAP. Rated one of Washington's top 100 restaurants! Tonight was the amazing auction party in the gorgeous studio of renowned Washington sculptor John Dreyfuss at Halcyon House in Georgetown. DJs Yellow Fever rocked the house. Check out the wonderful crowd of folks who came out to support emerging artists in Washington, DC. Lots of fun and art buying was had by all. We almost got a piece by artist, Tang but, alas, it got away. Bidding was good! Congrats to everyone who made this auction a hugh success and one of the best events of the year! Join Washington, DC artist Freya Grand at Gallery 211 tonight. Opening reception November 17th, 6-9 p.m.
Gallery 211 presents a solo exhibition featuring the landscape oil paintings of artist Freya Grand. 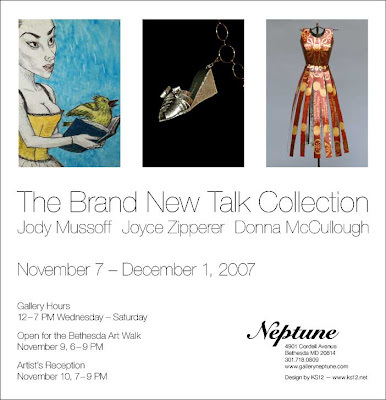 The Cultural Development Corporation (CuDC) is requesting proposals for exhibitions in the Gallery at Flashpoint for the September 2008 – August 2009 season. This request is open to artists, independent curators, arts organizations, private galleries or anyone choosing to present contemporary work in any medium. All proposals must be received no later than 5 pm on Friday, January 11, 2008. The Lee Arts Center studio artists will hold their annual fine crafts show and sale featuring pottery, sculpture, prints and jewelry, just in time for the holiday season. Also featured is a Raku Party on Saturday, November 17 from 10 a.m. - 3 p.m. Choose a ceramic vase, pot or bowl, glaze it with the help of the Lee artists, and watch it fired in a blaze of flame and smoke - then take it home the same day! Show and sale hours: 10 a.m. - 4 p.m. both days. Hours: Open Tuesday-Sunday 11 to 4; also open one hour before performing arts events in the Katzen and from 6 to 8 on Open Arts Nights (select Thursdays while the university is in session; the next event is Dec. 6). Admission: Free. Gallery talk: Jack Rasmussen, director and curator of the American University Museum, will discuss Irving Norman's work Dec. 1 at 4pm. The Phillips Collection Center for the Study of Modern Art's 2007-2008 Conversations with Artists series focuses on artistic partnerships, featuring artists who work together in collaborative practice. Ilya and Emilia Kabakov are Russian installation artists based in New York. Ilya, a leader of the Russian art movement known as Moscow Conceptualism, has been making installation art since 1984 and is one of the medium's most important practitioners and theoreticians. In 1989, he and Emilia began working together, with Emilia acting as translator, organizer, and originator of critical ideas. Center programs are supported by a generous grant from The Brown Foundation, Inc., of Houston. A special edition of Artful Evenings, featuring two unique Curator's Perspective tours of Impressionists by the Sea with Chief Curator Eliza Rathbone at 6 and 7 pm. Live music and wine bar all evening long. Book your tour now and walk through this magnifient space with extraordinary artwork! Tours of the Walter Washington Convention Center’s art collection, the largest collection in DC that is not in a museum, will be led by co-curator Vivienne Lassman. The $4 million permanent art installation features paintings, sculptures, photography, graphics, and mixed media works created by local, national, and international artists. *All tours are scheduled at 12:00 Noon on the dates listed. The diverse $4 million art collection at the Walter E. Washington Convention Center is the largest in any convention center and the largest public art collection in Washington, DC outside of a museum. With 137 works art of by 93 artists, the collection of site-specific sculpture, painting, and photography brings a sense of human scale to the Convention Center. Washington area artists created more than half of the collection. The Shaw Wall celebrates and honors the historic Shaw community, one of Washington's oldest African American neighborhoods and home to the Walter E. Washington Convention Center. On the 72-foot long wall hang four monumental works by the team of Frank Smith and Arnetta Lee, Rik Freeman, Billy Colbert, and Deirdre Saunder. Register for your tour of the Walter E. Washington Convention Center art collection by calling the 24-hour Washington Convention Center Authority (WCCA) Community Hotline at (202) 249-3200 and stating your name, telephone number and your preferred tour date (see schedule above). A WCCA staffperson will return your call to confirm your tour. Reserve your space now! Each art tour is limited to a maximum of twenty-five participants. Walk-ups may participate in the art tours only if space is available. Join G Fine Art and the Arts Community of Washington, D.C. Send your contribution to: The Conservancy for Tibetan Art and Culture a 501 © (3) non-profit organization. All donations are tax-deductible to the extent allowed by law. Respond to rsvpTibet@gmail.com and donate by paypal or send contributions to: CTAC, p.o. box 6598, mclean, Virginia 22106 Thank you!!! A few thoughts after attending the opening reception of this hugh and graphic exhibition..... Anyone who sees this show will not walk away unmoved. Artistically, it calls up great master painters such as Goya and Picasso who also voiced their outrage at the attrocities of war. Fernando Botero paints a chilling and gut wrenching modern version of an ancient indulgence. Here, aggression, fear and pain leave an indelible longing to understand the inconceivable flaws of mankind. This is an important exhibition which bears witness to today's realities of war. Botero constructed each work after reading official reports of the atrocities and concentrated on the suffering and dignity of the victims rather than their tormentors. Botero unveiled these controversial works in Europe in 2005. This is the first showing of the Abu Ghraib paintings and drawings in a museum in the U.S. The show is presented in collaboration with the university's College of Arts & Sciences, Schools of International Service, Public Affairs, Communications, Kogod School of Business, and the Washington College of Law. "American University's long-standing commitment to international human rights makes us a natural host to display Botero's work," claims AU Museum Director and Curator Jack Rasmussen. "Through his distinctive painting style, our students, faculty and, especially, the Washington, D.C. community will be able to discuss human rights and war not through a political lens, but through art. Art cannot change the war but it can bear testimony." Building is open to the public during regular business hours, call about additional hours. Direct access to the Farragut North Metro. Washington Square 202.296.2800. A group exhibition of contemporary landscape photography including work by Anna Druzcz, Lee Goodwin, Lawrence Hislop, Maxwell MacKenzie, Andrzej Pluta and Mark Even Thomas. 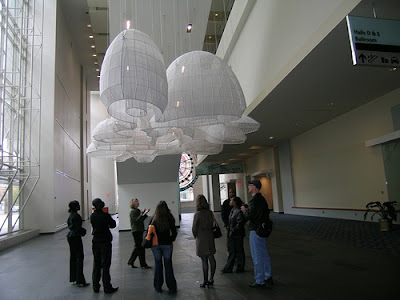 Today I took a tour of the Walter Washington Convention Center Art Collection. It is the largest art collection in DC that is not in a museum. The tour was led by co-curator Vivienne Lassman. The $4 million permanent art installation features paintings, sculptures, photography, graphics, and mixed media works created by local, national, and international artists. This is a major collection of art in Washington, DC. The scale of some of the pieces is breathtaking, set in a massive volume of building space. The whole collection is stunning and a delight to visit. The tour is led monthly by DC Art Curator Vivienne Lassman who discusses the collection in depth with her expert knowledge. Stay tuned for more tour dates and times. Click here to see pictures from today's tour. The book and exhibit showcase bunk canvases featuring scrawled inscriptions, signatures, cartoons, and poems by young servicemen headed to combat in the Vietnam War aboard the troopship the USNS General Nelson M. Walker. The ship shuttled thousands of young Americans ― most in their teens ― to Vietnam in 1966 and 1967. The graffiti included messages of patriotism, politics, humor, anxiety, and love, written for personal comfort, or to be seen by other troops who would then add more. Please join Maryland Art Place (MAP) and Maryland Lawyers for the Arts (MLA) on Thursday, November 15, for an Artists' Practicum: a guide to the basic legal knowledge necessary for artistic survival in the marketplace. The session will cover contractual issues in the creative industry, copyright for nonlawyers, and the Visual Artists Rights Act of 1990. The panel includes MLA Board President Michael Yang, Esq., and board member Cynthia Sanders, Esq. The practicum will be held within MAP’s galleries. Admission is free and open to the public, but reservations must be made by calling 410-962-8565. Emerging curators are encouraged to submit proposals for MAP's 6th Annual Curators' Incubator Program. This annual program remains dedicated to promoting the talent of new and emerging curators within our community—recognizing the obstacles that face curators as they work to gain experience, while providing encouragement and guidance through the complete curatorial process. Featuring over 125 artworks by Washington, DC area emerging and established artists. THE AUCTION IS SOLD OUT! Due to early and over-whelming support by the Host Committee, as of Friday October 26th, the 4th Annual Transformer Silent Auction & Benefit Party is completely sold out! They are happy to take donations, but are not able to accomodate any further guest ticket purchases. The Annual Transformer Silent Auction & Benefit Party generates close to 1/3 of the annual income, providing necessary support, in tandem with grant awards, that allows them to grow and advance their work in support of emerging artists and emergent expression in the visual arts. Marilou Donahue's November arts web site is up. Check it out and enjoy. Gallery 211 presents the exhibit Landscapes featuring the oil paintings of Washington, DC painter Freya Grand. Ms. Grand's large scale landscapes are evocative in their otherworldly theme, and yet they are simultaneously contemporary. These works illuminate the mutability of the passage of time within a particular space. The images are drawn from places as diverse as the Andes and coastal Ireland, and they reflect Grand's love of the mysterious beauty of the natural world. As a counterpoint to the large works, Ms. Grand will also be showing a series of miniatures: very tiny oil paintings on mylar. These intimate studies of landscape painting invite close inspection, as if one is peering through a keyhole at a world on the other side. A catalogue of the show will be available at Gallery 211, with an introductory essay by Jack Rasmussen, Director of the Katzen Art Museum at American University in Washington, DC. Website down, is it gone forever? Well, the bad news is that the server went down for my website today. The bad bad news, it's not only an equipment failure, but the redundancy factor that is supposed to save web site information, may be lost..forever. 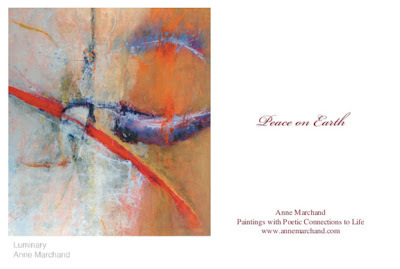 So tonight, I have no website at www.annemarchand.com. I am praying for an overnight miracle that will retrieve the data from cyberspace and restore my presence on the world wide web. I'm told everyone is working on it. I'm not panicked yet. Let's see what the morning brings. The Lona-Frey Exhibition is a historically significant collection of contemporary artworks. The collection consists of lithographs and photographs by several canonical figures of postwar (after 1945) American art, including Sam Gilliam, Roy Lichtenstein, Robert Motherwell, and Robert Mapplethorpe. Diversity: Think Globally. Eat Locally. The Food Glorious Food Show serves up an eclectic menu of paintings, sculpture and photographs depicting food in all its fabulous forms. The food calendar will be available for a minimum donation of $15 at the locations listed below, with all proceeds going to the food bank. Highlights of the evening will include a silent auction, dishes prepared by participating chefs and an international wine tasting. Tickets to the popular event, benefiting the Capital Area Food Bank, are $50 per person or $90 per couple. They can be purchased by calling 202-783-2963. Calendars: Available at Zenith Gallery, the Capital Area Food Bank, Politics and Prose, Bridge Street Books and other locations. Southern California born but Northern California raised, artist Rick Reese has been painting and drawing for as long as he can remember. He got his start in the Comic Book and Toy industries where he continues as a freelancer to this day. Rick spends his days painting, surfing, or teaching at Cal State Long Beach where he indoctrinates his students and paints on things that don't belong to him. The addition to 20 new artists to the Art Whino Permanent Gallery features the work of its artists' collaboration from around the world. Music by HoneyLab's DJ David Christ Superstar. The music will be broadcast live by Orcradio.com. Art Whino's collqboration artists, Decoy, will showcase a live art installation during the show which one lucky person will get to take home! ￼Be an Owner or a Donor of a DC PLAY BLOCK to Support QUALITY Preschool in the District! Go to auction site on home page of www.dcplayblocks.org. Tickets are $50 per person and can be purchased through PayPal in the auction section, home page of www.dcplayblocks.org. Ellyn Weiss is one of the many artists in the Mt. Ranier compound who will be opening their studios on Sunday, Nov. 11 from 1 - 5 pm. Her studio address is 3708 Wells Ave, Mt. Ranier - it's in the same compound as the Washington Glass School. See all of the other wonderful art being done out here. The complex is 2 blocks from the DC line. From DC, take Rhode Island Ave to Monroe St - it's a light - where you take a right. Take Monroe a few blocks, cross Eastern Ave past the "Welcome to Historic Mt. Ranier" sign and then take the second right on Otis. Follow Otis a block or so until you come to the light industrial compound. Take a right into the compound just before the Glass School. Coming from the Bethesda end of the world, take Military to Missouri, past North Capitol to right on South Dakota. Then make a left on Monroe (it's a light), follow it across Rhode Island and then it's the same as above, right on Otis. The studios are closer than you think and it's worth it - so go visit these good artists! A visit today to the Mid City Artist's Open Studio of Chuck Baxter provided a detailed look at this unique artist's work. Chuck finds his art materials on the streets of his neighborhood and other neighborhoods in the city. He transforms discarded objects and materials that litter the streets into handmade objects of art. Some of my favorites are his cyclone-like vases made from printed papers that he staples together. Another work that attracted my attention resembled a purse exposing its contents. It is made from shredded bits of vinyl and other discarded objects. Baxter weaves functional baskets from the most common material, ordinary plastic bags. I am always surprised and delighted to see this artists keen sense of design and wit, combined to make some very intriguing works of art. To contact the artist and see Baxter's work go to www.midcityartists.com. I recommend buying a piece or two of his work at these affordable prices. Many artist studios within walking distance of the Dupont/Logan Circles will be open for visitors with over 20 artists exhibiting. This is a unique opportunity to see some of DC’s most exciting artists in their ‘home environments.’ Check out the burgeoning local art scene that is finding its focus in the dynamic Mid City neighborhoods, and visit some of the supporting Galleries and art related businesses that have recently opened – following the artists into this upscale urban environment. Approximately 200 snapshot photographs chronicle the evolution of snapshot photography from 1888, when George Eastman first introduced the Kodak camera and roll film, through the 1970s. Examine the range and creativity of amateur snapshot photography in our interactive feature about the exhibition. Kool Web Book Feature - check it out! Katharine Hepburn, one of the most iconic actresses of the 20th century, is the latest person to be featured in the National Portrait Gallery’s “One Life” gallery. Hepburn was a 20th-century icon who carefully constructed and maintained her own myth, from her earliest days in the studio system through more than 50 years on stage, screen and television. The exhibition includes her four Oscar statuettes—the most won by anyone for best actress—images from her life and career and a video kiosk that will play clips from a selection of her work. from 11:30 a.m. to 7 p.m.
November 2, 2007, 6.30pm - 9.15 pm. $100 per person. Sponsorships available ($500 - $10,000). CentroNía is celebrating its 20th Anniversary with a Gala presented by Capital One and with special recognition of the Freddie Mac Foundation. The international, invitational art sale and live auction will feature paintings, sculpture, photography glasswork, jewelry, and ceramics; a sumptuous buffet reflecting the cuisines of the Caribbean, Latin America, Africa and the United States; and smooth jazz by Infinite featuring Mr. Young. CentroNía is thrilled to announce the centerpiece artwork that will be offered in a live auction at the gala: "Suite for Sergei," a Lou Stovall silkscreen print. The evening will be emceed by Steve Villanueva of NBC Channel 4. Finally, the excitement of the evening will culminate in a live auction that includes pieces by eminent contemporary artists, including Sam Gilliam (mixed media, US), Michael B. Platt (prints and drawings, US), Virginia Schofield (paintings, US), Evangeline J. Montgomery (paintings and metalworks, US), Mary Grigonis (oils, US), Carmen Barros Howell (paintings and sculpture, Chile), Jorge Jacas (ceramics, Cuba), and Felix Angel (silkscreen prints, Colombia), Gustavo Lara Torrez (Serigraphy, Bolivia), Willie Leftwich (United States) and Rafaella Pitti (Bolivia) as well as works for sale by such notable area artists as Winston W. Harris, Joyce Wellman and others. CentroNía is a 20-year old community-based organization that provides high-quality education to children and families in the Washington DC metropolitan area, and the event will raise funds for the organizational educational programs. CentroNía will also honor local champions for children and youth Barbara F. Kamara, Administrator of the Early Care and Education Administration of the District‚s Department of Human Services and Maxine B. Baker, life-long child advocate. A special recognition will be given to the Freddie Mac Foundation, known for its outstanding support of children and families. Visit: www.centronia.org for more information. Mexican Cultural Institute | 2829 16th Street N.W. 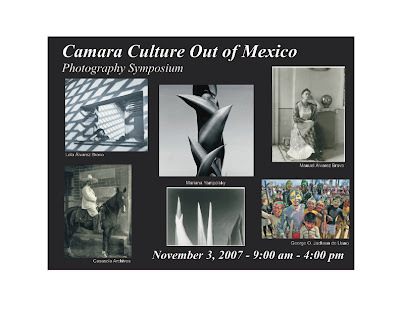 | Washington , D.C.
“Camera Culture Out of Mexico” is one-day symposium to present the public with an overview of trends and movements within Mexican photography, and by Mexican and Mexican American photographers since the Mexican Revolution until today. Part of the “Mexico at the Smithsonian” program series, this symposium is being presented in conjunction with several photography exhibitions including the Casasola Archives, Lola Alvarez Bravo, Mariana Yampolsky, Graciela Iturbide and others. The Adamson Gallery will be open Saturday night, with its extended showing of Chuck Close's New Work. The gallery will show several bodies of work by this noted performance artist all loosely united around the multi-layered concept of "ground" and a search for the spiritual in everyday life. Hemphill Fine Arts opens two shows; James Huckenpahler's Mindless Pleasures and David Bryne in Furnishing the Self – Upholstering the Soul. G Fine Art opens with Linn Meyers. The Hirshhorn recently acquired works by Meyers, as well as G Fine represented artists iona rozeal brown and Ian Whitmore.